By now, most anyone who keeps up with financial matters knows that a flat or inverted Treasury yield curve is a good predictor of an impending recession. I've blogged extensively on this subject for almost 10 years. Recently, a few industrious pundits have found evidence that the front end of the Treasury curve is "close to flat." While it's hard to argue with their facts, an almost-flat curve is not the same as a flat or inverted curve. The latter occur only when the market looks into the future and sees good evidence that the Fed will no longer tighten policy and will very likely ease policy at some point. We're not there yet. Chart #1 shows us what the market has thought the target Fed funds rate will be in December of next year. One year ago, on the left end of the chart, the Fed funds futures market expected the funds rate to be 2.0% by December '19; it now expects the funds rate will be 2.7% by December of next year. That is essentially equivalent to two more Fed tightenings, from the current 2.25% to 2.75%. 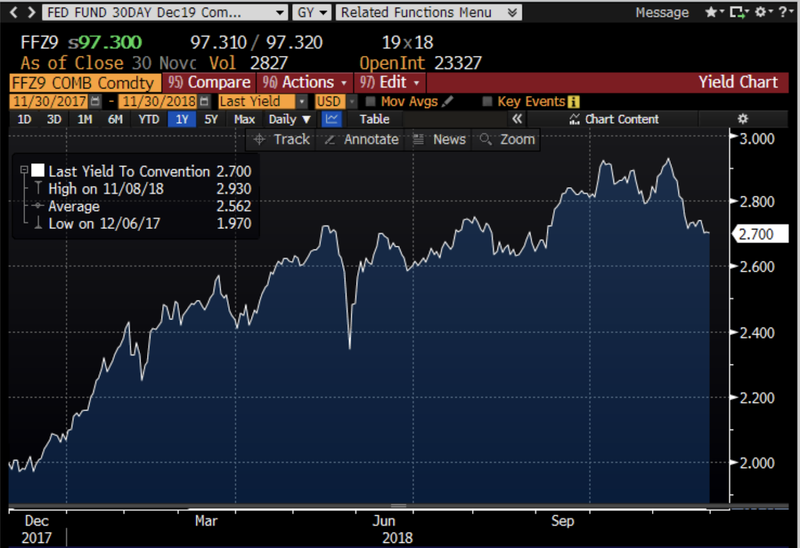 Currently the market does not expect the Fed to do anything more beyond December '19. "Two more rate hikes and the Fed is done" is the current meme. That implies that the economy is quite likely to continue growing for the foreseeable future, but not at a very impressive (nor worrisome) pace. Note that expectations for the future target rate have dropped by almost one tightening in past few weeks, and that in turn has been driven by news suggesting the economy is proving a bit weaker than previously thought. In any event, it's hard to get worried about a mere 50 bps increase in short-term interest rates for the foreseeable future. Chart #2 looks at the front end of the real (inflation-adjusted) yield curve. This is arguably the only yield curve that really matters; real interest rates are the true measure of the cost of borrowing, not nominal rates. The blue line is the real Fed funds rate (the target funds rate (2.25%) less the year over year rate of inflation according to the Core PCE Deflator (1.8%), the Fed's preferred measure of inflation. 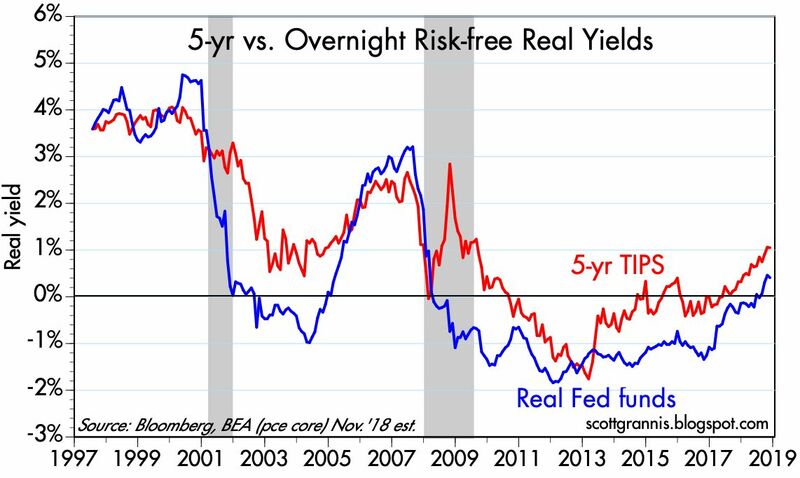 The red line is the real yield on 5-yr TIPS (Treasury Inflation-Protected Securities), which can also be thought of as the market's forecast for what the real Fed funds rate will average over the next 5 years. This measure of the yield curve is still positively-sloped. Note that it has been inverted (i.e., when the blue line exceeds the red line) prior to the past two recessions. We're not there yet. This chart tells us that the market fully expects the Fed to tighten monetary policy further (by increasing the real funds rate), but not by much. Chart #3 shows the most common and generally most-favored measure of the yield curve: the difference between 2-yr and 10-yr Treasury yields. The top portion shows the history of these two yields, while the bottom portion shows the difference between the two (i.e., the slope). Note first that the 2-10 slope quite often becomes flat or almost flat, and it does so sometimes many years in advance of recessions. It's almost flat now (20 bps), but that's hardly unusual during a period in which the Fed is raising interest rates. 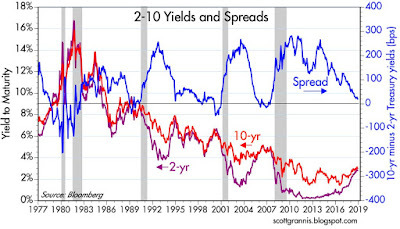 Chart #4 effectively zooms in on Chart #3, showing the behavior of these yields and their spread over the past year. Note that this portion of the curve was actually a tiny bit flatter back in August than it is today. Chart #5 is where things get more interesting. 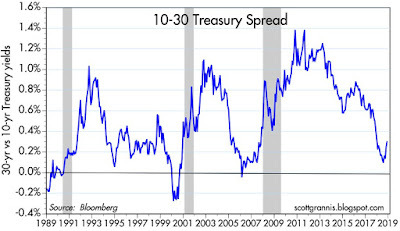 This shows the difference between 10- and 30-yr Treasury yields. This portion of the yield curve has been steepening since last July. Inversions in this portion of the curve have been reliable predictors of recessions, but we're definitely not there yet. To judge by this chart, a recession, if one is in the cards, might not occur for at least several years. And to judge by Charts #3 and #5, what is going on today in the yield curve is similar to what happened in the mid-1990s. Back then the economy was in the early innings of what would prove to be a very strong growth phase, which was followed by a mild recession in 2001. In any event, it's possible, and likely, that good news on the global trade front could alter the bond market's expectations rather dramatically, resulting in a steeper yield curve and ultimately a stronger economy. Looking over these charts; it appears that some indicators are similar to what they were back in 1995. There are differences of course, but charts #3 and #5 in particular are the most similar. 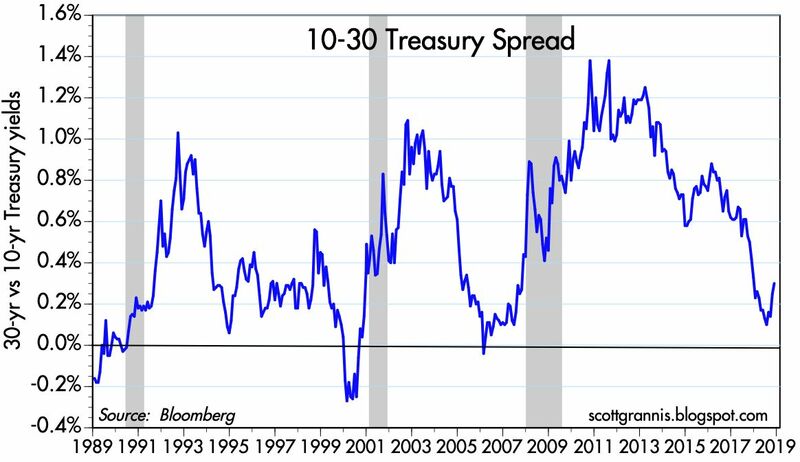 That is lowering 2-10Y Spreads near zero coupled with a rising 10-30Y spread near 0.2%. Could these be global Goldilocks conditions? The most significant difference is that current inflation rates are lower now than what they were back then and corporate profits are rather high as a % of GDP (at least in the US). It's great that prospects for a prolonged period of relative economic stability is entirely possible, which appears to be the Fed's current target. I apologize for such a basic question, but I am somewhat new to this and trying to get my head around the components of yield curve inversion. You said that the yield curve inverts "when the market looks into the future and sees good evidence that the Fed will no longer tighten policy and will very likely ease policy at some point." I sort of understand why there might be less demand for shorter-term notes (2-year) in that scenario (and thus higher yields). But I cannot understand why there would be more demand for longer-term notes (10-year), and thus lower yields. Can you, Scott, (or anyone) give me a high-level explanation of why this might be so? Great commentary and wonderful numbered charts in the last two posts. I am a little concerned that property appreciation and lending appears to be cooling off. That plays a key role in the growth of the so-called endogenous money supply. Of course we have seen this pattern a few times: property values begin to fall so banks stop lending on property which causes property values to fall. These recessions always seem to start in real estate. "rwjones" re why longer-term rates are lower: If investors expect a recession is just around the corner, demand for longer-term Treasuries will rise relative to demand for shorter-term Treasuries. Long-term rates tend to fall more than short-term rates because investors want to "lock in" long-term rates and because the price gains that occur when rates fall will be much higher for long-term Treasuries because long-term Treasuries have much greater price sensitivity to changes in rates. about Treasury yield curve inversion. Your commentary was valid for three days ! That may be some sort of record ? do none harm pangloss. take 6 months off. Thanks, Scott. I appreciate the explanation. Scott: a FI novice here fumbling for some answers. 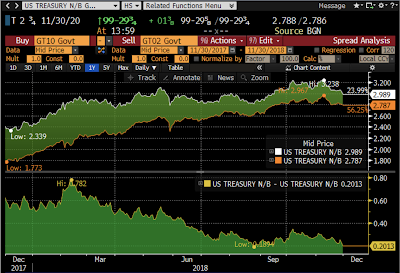 Could it be possible that the Quant Tightening taking place now by the Fed (in unwinding its balance sheet) is having a pronounced effect on the short end of the yield curve, thereby causing this flattening and inversion in some spots. Looking at FRED data, in the past year (thru last week's end), the vast majority of Fed assets being sold into the market are 1-5 year Treasuries causing yields to rise on the short end. Might Wee Man, re whether Fed balance sheet reduction has pushed up short-term rates and thus contributed to a flatter yield curve. I very much doubt this theory. To begin with, the Fed has been selling its holdings of short-term Treasuries for the past few years at a fairly steady pace, yet only recently has the yield curve flattened. Two, the amount of Fed sales is tiny (less than 10% if memory serves) relative to the outstanding stock of short-term fixed income assets; thus it’s hard to believe that these sales could have resulted in a significant rise in short-term yields. Does the most recent inversion negate your Point of view? There's so much focus on the implications of an inverted yield curve I doubt it's veracity at this point. Once an "indicator" is so well known it's implied use has run it's course. IMHO. 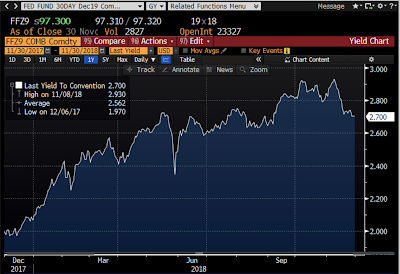 Is one potential reason for the recent lower 10 year treasury rate the effect of further flights to the safety of the US dollar and US assets driven by recent weakness in Europe and China? Re: "Does the most recent inversion negate your Point of view?" No. As should be obvious from my yield-curve related charts, inversions can and do happen without recessions immediately following. So even an overt inversion of the curve (which we certainly do not have today) is not a reliable indicator of an impending recession. 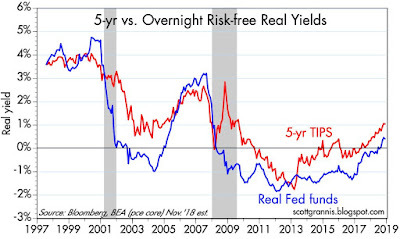 I've also tried to emphasize that it's the combination of an inverted yield curve and very high real short-term rates that is the better indicator of an impending recession. Today, real short-term yields are barely positive. So I continue to maintain that despite all the yield curve flattening we've seen, we are not facing a recession for the foreseeable future. Re: "Is one potential reason for the recent lower 10 year treasury rate the effect of further flights to the safety of the US dollar and US assets driven by recent weakness in Europe and China?" I think so. 10-yr Treasuries are classic "ports" in a financial storm. There is a huge amount of concern everywhere over the global situation, particularly China. It's not surprising that Treasuries are the beneficiaries of weaker stock prices. You said in Chart #3 "Note first that the 2-10 slope quite often becomes flat or almost flat, and it does so sometimes many years in advance of recessions." It's almost flat now (20 bps), but that's hardly unusual during a period in which the Fed is raising interest rates." <-- I concede you are correct that has not happened yet but I did not see you mention in your charts about any particular inversions happening, only that you mentioned that many times in history curves have flatten are come close to inverting, am I missing something? Another reason for lower yields on Treasuries is the important decline in oil prices. Lower oil prices feed directly into lower inflation expectations. Expected inflation, as evidenced by the difference between real and nominal Treasury yields, has declined very much in line with lower oil prices. 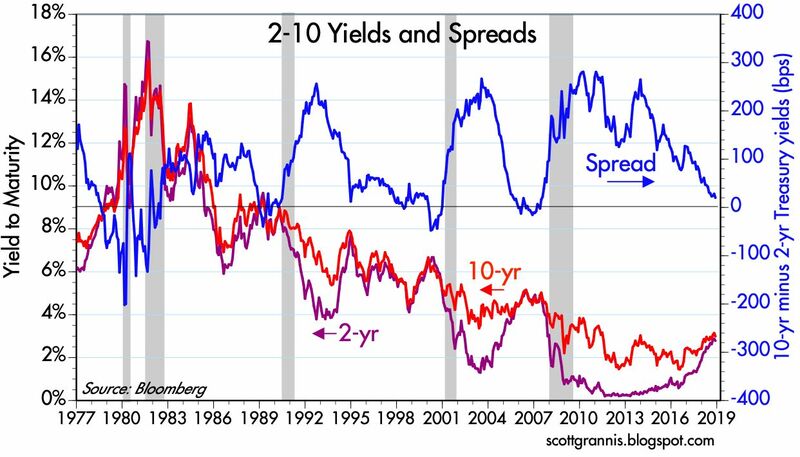 Real yields have declined by much less than nominal yields. So two factors have driven Treasury yields lower: concerns about the global economy and lower oil prices. Unlike Scott, I am not sanguine about our POTUS coming around on this issue. He has long been a protectionist and has surrounded himself with sycophants (except LK of course, who is window dressing) that espouse his nonsense. Make America great? More like make America broke. Great set of charts, analysis, and perspective, as always, Scoot. Thank you. Do you look at the debt situation, both corp and govt? There is a narrative (although not discussed prominently as tariff and rates) that debt is a ticking time bomb that the economy and market is ignoring. The debt payments could put significant strain on both corp earnings and govt spending. How do you figure all that in your analysis?